Shellfish is one of my favorite foods and when it is available at reasonable prices I can’t pass it up. Our local warehouse store has bags of Calamari, Shrimp, Scallops and Mussels (Seafood Blend) at a reasonable price. It was a 3.5 lb. bag and I was able to get by with using only half and saving half in the freezer for another time. Of course, only three of us ate, so if the mouths you have to feed are more numerous, the whole bag would have to be used. The amount I purchased would make an ample dinner for six people. One of my favorite things to do is to make what I call ‘clean out the refrigerator’ soup. 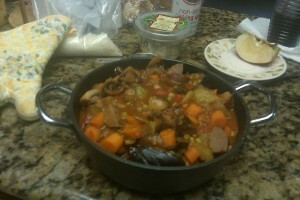 So to make the Cioppino, I used what I had on hand which is the following: 1 Onion, 3 ribs of Celery, 3 Tomatoes, 2 Potatoes, 3 Carrots, Mushrooms, frozen Baby Peas, leftover Marinara Sauce, Tomato Paste, Balsamic Vinegar, Marsala Wine, Salt and Pepper plus fresh Basil and Oregano and some ground Thyme.. 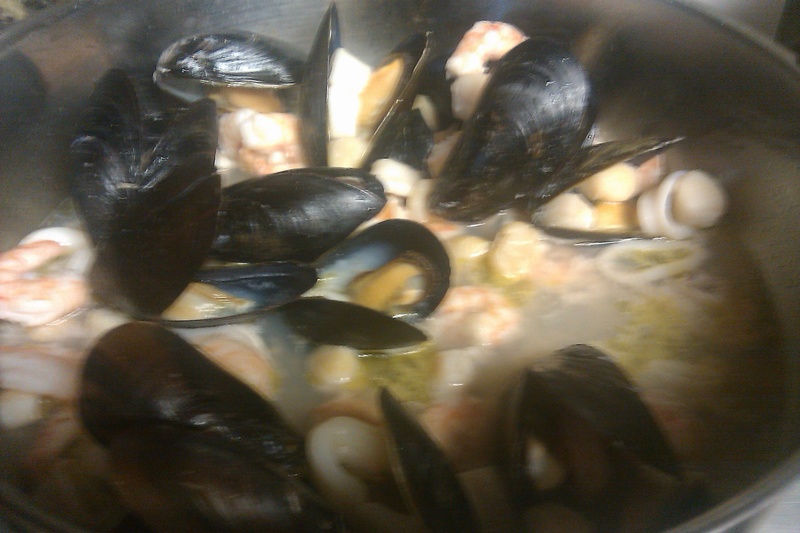 I had some lobster shells and shrimp shells in the freezer with which I made a seafood stock. And of course, there was the bag of shellfish that I had purchased. I used a 12 cup pot in which I melted some Butter (about 4 Tbsps. ); Olive Oil would be a healthier way to go and would have preferred that to the butter, but thought about it too late. In the melted Butter, I sauteed a diced Onion, sliced Celery and Carrots and the Mushrooms. When they were softened and just beginning to caramelize I add the Seafood Stock which I strained before adding. I also added the Marinara Sauce and let the whole thing simmer for about half hour. While the soup mixture was simmering I added a whole Jalapeno just to give it some umph. This was a fresh Jalapeno from a plant I have growing outside and the fruit of this particular plant is extremely hot, so I left it whole to prevent too much heat from penetrating the soup. I then sauteed the seafood blend in some hot Olive Oil and let it cook for about three minutes or until the Mussels were fully opened and the Calamari was fully cooked. Be careful not to overocok seafood as overcooking it will toughen it. I tasted the Vegetable Stock mixture and then added enough Salt and Pepper to season it along with the fresh Basil & Oregano. I also added about 1/4 teaspoon of ground Thyme. If you have fresh Thyme, that would be even better. It still needed some zing so I added a dash of Balsamic Vinegar and a splash of Marsala Wine. 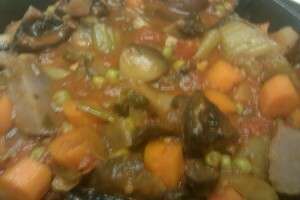 Just before serving, I placed the cooked seafood in my soup serving pot and covered it with the vegetable mixture. I served the Ciopinno with garlic bread. This provided a hearty meal which went very well with a green salad, which by the way is not necessary as the soup is plenty to satisfy one’s appetite.